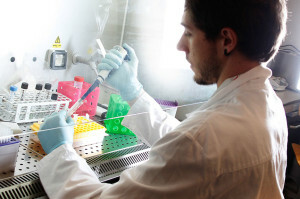 VisMederi offers its clients a vast portfolio of life sciences services which includes serological and virological assays development, diagnostic testing for the assessment of the efficacy of new drugs, cell culture services and project management operations mainly related but not limited to clinical trial protocols. The combination of these services has the primary aim of supporting the client in the development of strategic solutions modelled to best suit specific needs. To address these requirements, our company offers full project management services, from study planning through to its completion with the possibility of conducting custom-designed assays. The tests carried out within VisMederi facilities continuously undergo validation and standardization procedures in order to ensure high-quality protocols applicable in both in clinical trial settings and in research contexts. All laboratory testing is performed in BSL2 and BSL3 containment facilities according to an ISO 9001:2008 certified quality system, integrated with GLP and GCP.